Recipe adapted from America's Test Kitchen's Vegan For Everybody. [Recipe makes (12) 4-inch pancakes]. Vegan pancakes are something that we tried to tackle about a year ago, and recipe after recipe came out the same: flat and dense. When we bought America's Test Kitchen's new vegan cookbook early this year, we were excited to see a pancake recipe, since their recipes almost never fail us. Attempt number one happened, and you know what? They came out flat and dense! After some trial and error, we realized that the flax milk (or oat milk) had to be warm; not straight from the fridge. This change made all the difference. We also added some oats to give the pancakes structure, and also gave the batter a resting period in the fridge to thicken up some. All of these modifications helped, and now give us the perfect, fluffy pancakes every time. In a large mixing bowl, pass the flour, sugar, baking powder, baking soda, and cinnamon through a sifter. Add the ground flax seed, kosher salt, and rolled oats. In a second smaller bowl, whisk together the warm milk, melted coconut oil, and lemon juice. Add the wet ingredients to the large bowl of dry ingredients, and stir with a rubber spatula until everything is incorporated. [Side note: As with similar batters, only mix until you no longer see the flour. Over-mixing can create tough pancakes, since you're developing gluten]. Cover your batter with plastic wrap, and transfer to the refrigerator for 30 minutes. Once the batter has set up, preheat your electric non-stick skillet to 350°F (or non-stick pan over medium-low to medium heat). Scoop out batter, and let the pancakes cook for 2 to 3 minutes, or until the edges are set. Carefully flip, and continue cooking until both sides are golden brown, and fully cooked inside. Transfer pancakes to a cooling rack while you finish cooking the remaining pancakes. 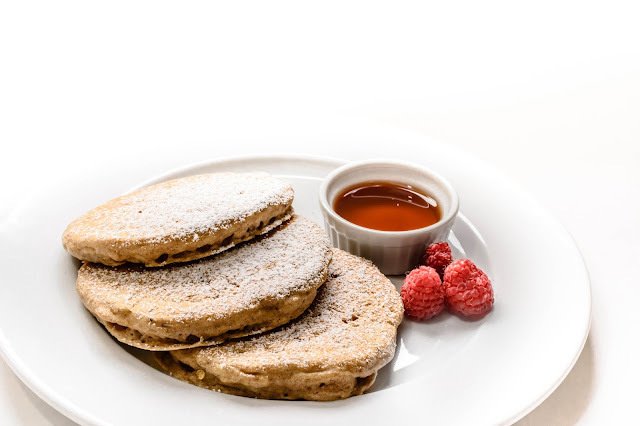 If you wish to save some of your pancakes for a later date, we love to freeze any extra pancakes on a cooling rack. To reheat, defrost in the microwave, and then finish in a toaster to crisp them up a bit.